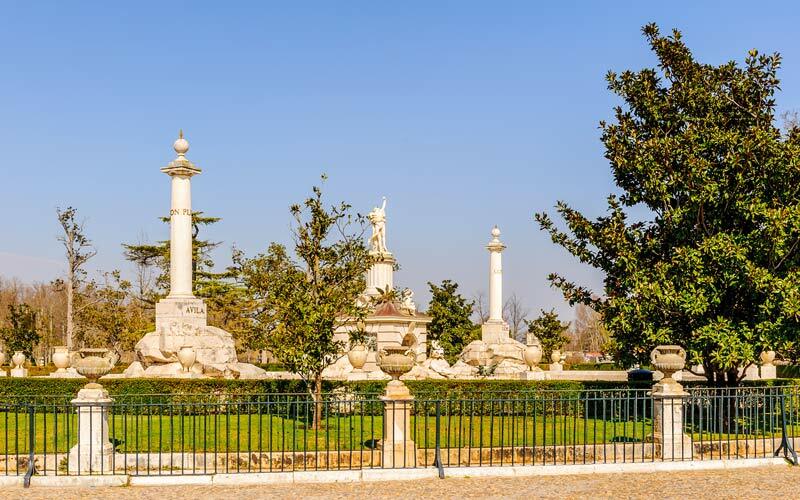 The Royal Seat of Aranjuez, in the south of Spain next to the Tagus River, is an authentic oasis in the middle of an inhospitable Castillian mesa. The ancient Persians called it “pairidaeza,” which is derived from the Spanish word “paraíso,” which means “private garden.” The concept of “paraíso” is one of a place that is unshackled by the imagination and grants whatever the heart desires. The setting for sumptuous parties, it was a world of magic populated by exotic plants and animals, where the court led a disillusioned and carefree life during the spring. 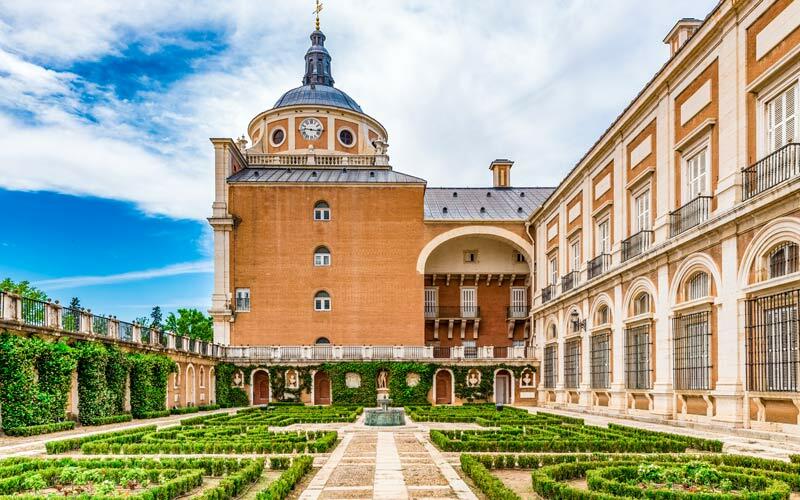 Today, the Royal Seat of Aranjuez is considered a prime example of multiple collections from different ages, comprised of both architecture and urban planning; and gardens and fertile orchards, where they grow delicious strawberries and asparagus. The origins of Aranjuez stretch back to a medieval palace of the Order of Santiago that passed from the hands of Catholic kings in the end of the 15th century. It was Felipe II who, in 1561, began a new Renaissance palace with the same type of architecture as El Escorial, Juan Bautista de Toledo, and Juan de Herrera. However, the building was not finished until the second half of the 18th century. This monarch, who was very fond of gardening (see El Escorial), ordered the construction of the Garden of the King, an intimate and closed-off space, next to the palace, surrounded by high walls; a “secret garden” of Italian inspiration. Felipe II also created the Garden of the Island, located in a triangular area formed by the Tagus River and a canal. The layout follows the model of Renaissance flamingo gardens; thus, gardeners of that same country were employed in these gardens in addition to gardeners from France and Germany. It is a sober space, with narrow streets that were originally covered with vines, forming tunnels, with a central axis that uniting a series of squares that were also enclosed in wooden trellises and decorated with fountains. All around, the space is divided into little compartments; rectangular and square hedges of boxwood, that in the era of Felipe II corresponded to knots of flowerbeds, made of up different fragrant plants like wormwood, rosemary, and santolina, filled with flowers, planted dispersedly or in clumps. Faithful to the exotic taste of the Renaissance, the Garden of the Island boasted a huge variety of flora, with plants from as far as Asia and the Americas, while also harboring exotic animals such as ostriches and camels, the latter of which was used for work in the garden. The garden, which was renovated during the 17th and 18th centuries, had its era of splendor during the reign of Felipe IV, which turned it into a great outdoor lounging area and used it for lavish parties and spectacles. The Marquise of Casa Valdés recounts that, in 1622, for the birthday celebration of the king, a theatre, lit by torches, was installed in the garden. The queen and her ladies performed a comedy, La Gloria de Niquea, written by the count of Villamediana, who, according to a popular rumor, was in love with the queen. Just after beginning, the stage caught fire, and when the king went in search of the queen to save her, he found her in the arms of the count. It is said that the fire had been set by the count himself with the sole purpose of having the chance to have the queen in his arms. Whether this is truth or myth, he just happened to be assassinated four months later. 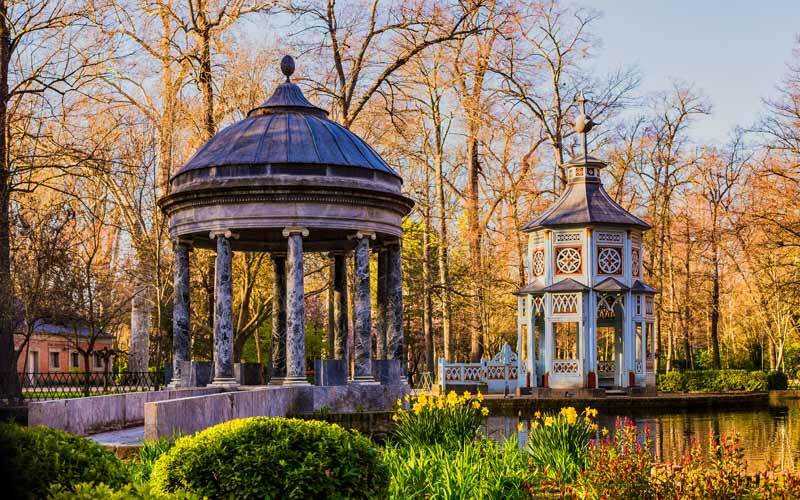 If the Garden of the Island has an atmosphere of the Austrian Renaissance, then that of the Prince is one of the first examples in Spain of a landscape garden, which came into fashion at the end of the 18th century and continued during the 19th century. It was created by Carlos IV between 1772, when he was still the prince of Asturias, and 1804. Its main architects were Juan de Villanueva and Pablo Boutelou, who was a member of the well-known dynasty of French gardeners. The extensive park of the Royal Seat of Aranjuez is, in reality, a combination of different gardens built atop old fruit tree orchards, where the formal and the natural is mixed. It is an enchanted forest full of surprises, while walking through the gardens, you can find a multitude of hidden treasures that will transport you to an era in which the mythological rules (that of Narcissus, Apollo, and Neptune) as well as picturesque elements, like a figurine pond with a Grecian temple, an Asian pavilion, a grotto, and an obelisk. These gardens create a world of dream and fantasy populated by dense trees and numerous different species of exotic animals brought in from scientific expeditions, like the trees that came from the southern United States: the Bald Cypress (Taxodium Distichum), the Tulip of Virginia (Liriodendron Tulipifera), and the Persimmon (Diospyros Virginiana). We cannot forget the invigorating presence of the Tagus River, which provides an unexpected marine element. A fleet of boats sit beside the river, imitating old galleys and gondolas that were transported to the court along with music and marine spectacles for new adventures in this Castillian Arcadia.